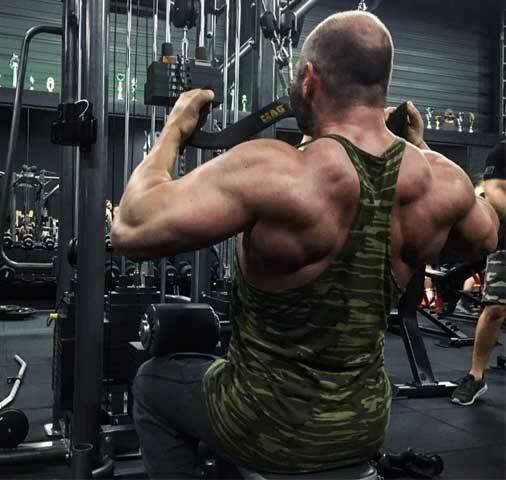 Over the course of this article we’re going to explain why you might not have seen the kind of back development you’ve been looking for so far, and provide you with some essential solutions to make the changes you need. You’re certainly not alone in your pursuit of a finely carved set of “wings” - this is one of the most sought after aspects of any physique and it can be very tough to develop. A great deal of back development relies on having a strong mind-body connection, as this is going to ensure that you use the appropriate body positioning to achieve maximum results when performing an exercise. It’s understanding this positioning that typically holds so many people back in the pursuit of a well developed back - even after several years worth of training, some people still aren’t completely “in tune” with their lats and how to engage them. Before we start, let’s review the muscles we need to develop. Latissimus Dorsi (Lats) - This is considered to be the “main” back muscle and it helps to create the wide appearance that’s become so vital to the aesthetic make up of any would be physique model. 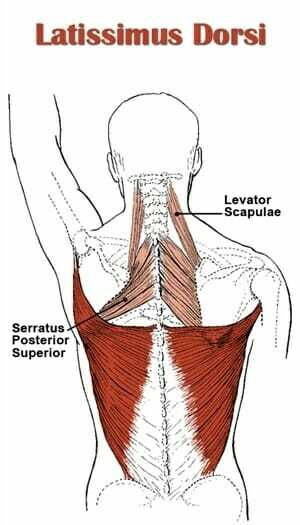 Teres Minor And Major - These muscles are sandwiched in between the lats and rear deltoids. They actually help to form the upper “half” of the “wings”, establishing the wing like shape which we all recognise as being so desirable. Rear Deltoids - This area is important in adding depth and width to the back - remember that this muscle extends out and represents the furthest extremity of the back due to the distance from shoulder to shoulder being greater than the distance from lat to lat. When fully developed, it will greatly enhances your overall back width. ​You should be working out your back just as hard as your front, and dedicating just as much time and effort to the things you can't always see. These exercises are literally some of the absolute best out there for creating the most incredibly developed back possible. You’ll need to include them all as part of your back routine on a regular basis, or at the very least, ensure every back muscle area is targeted during your workout. These exercises will effectively target the areas. Note that the upper traps will be integrated slightly but this area may be better focused on shoulder day. For any women reading, you may be worried about performing the deadlift being that many females (and males) regard it as being a waist “thickener” - don’t worry though as this is a myth﻿ ﻿and the exercise is truly essential for your development in a number of areas, not least the back. How-To: start with the bar at ground level and proceed to place the body in a seated position by bending the hips and knees to 90 degrees. 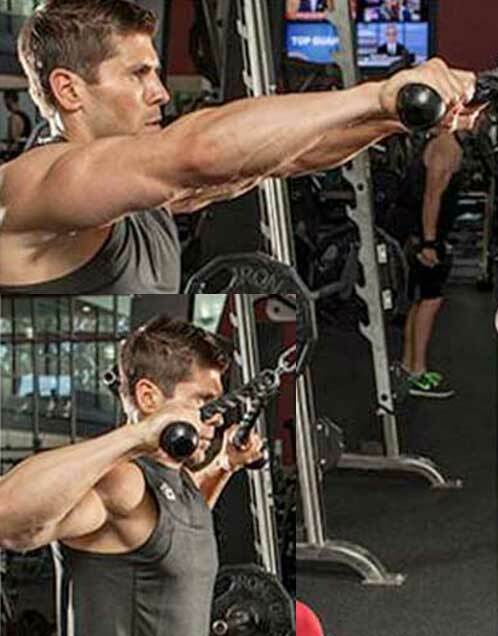 Now place your hands on the bar just outside of shoulder width with a grip of your preference. Proceed to pull the bar up and away from the ground whilst keeping the back straight until the bar rests at hip level, then return it to the ground before repeating the movement. You may also like our article on how to get bigger legs. A well-executed wide grip chin up will not only integrate the latissimus dorsi when performed effectively, it also targets all aspects of the traps and teres array. How-To: Find a pull up bar and grab it with a double overhand grip just outside of shoulder width apart. 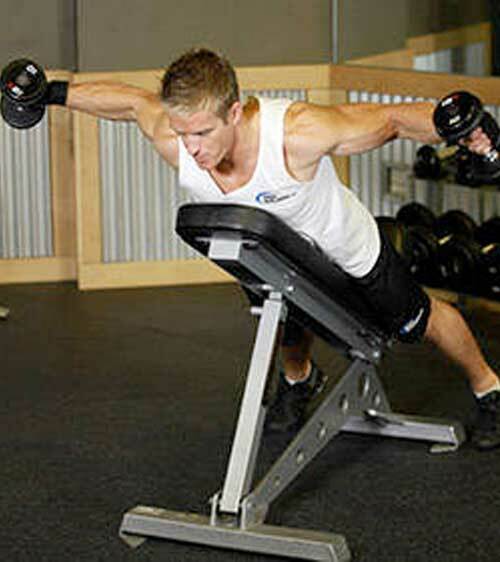 Bend at the elbows whilst elevating the body and pulling the chin towards the bar. Now, extend the arms and return to the starting position but without touching the floor and ensure a slight bend is kept in the elbows at all times. 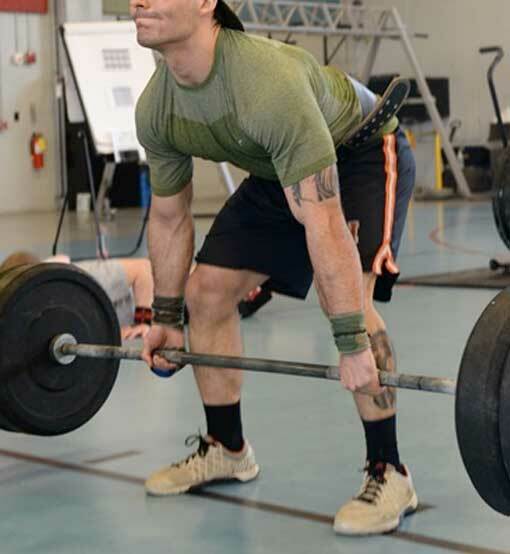 How-To: To perform a T-bar row, grab the row handles with a double overhand grip just outside of hip width apart. Proceed to lower the upper body until it reaches a 45-degree angle, and then with the arms outstretched, pull the bar into the stomach (just below the sternum) by bending the elbows to a 90 degree angle. Extend the arms and return to the starting position before repeating the movement. How-To: Grab a pair of dumbbells and hold them at hip height then proceed to lean the upper body forwards to a 45 degree angle. Outstretch the arms in a double neutral (palms facing each other) grip, before raising the dumbbells backwards and away from the body until they are in line with the shoulders. Keep your back straight throughout the movement - proceed to return the arms to the starting position and repeat the exercise. How-To: lie flat on the back and elevate a dumbbell above the body - hold it in line with the head by stretching the arms out and grabbing the base of the top section of the dumbbell with a “diamond” shaped grip so that both palms are facing outwards towards the ceiling around the central handle. Now proceed to stretch the arms backwards and away from the body whilst lowering the dumbbell until it is in line with the top of the head, then return to the starting position and repeat the movement. 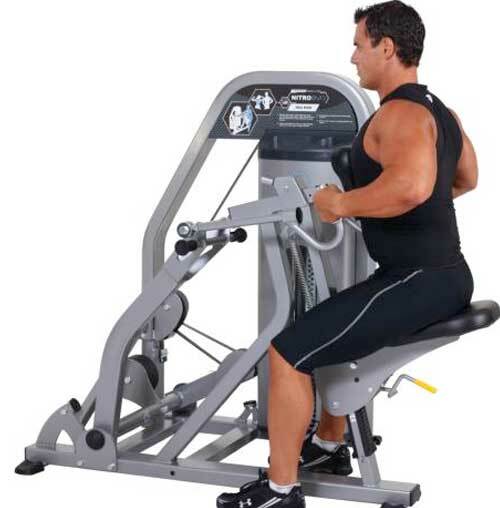 How-To: Sit on the high row machine and grab both handles with a double underhand grip. Proceed to pull the handles towards the armpits whilst keeping the shoulder blades tightly pinched together. Return the arms to the starting position and repeat the movement. How-To: Sit completely upright and grab both handles with a double overhand grip. Proceed to bend at the elbows until they reach 90 degrees and bring the handles back towards the body until they rest just in front of the armpits. How-To: To perform this exercise, grab a barbell with a double underhand grip just outside of your hip width. Proceed to bend the upper body forwards to a 45 degree angle whilst keeping the back straight and the legs totally still. From here, stretch the bar out in front of the body, and proceed to bend the elbows whilst pulling the bar up to the stomach. From here, extend the arms and return to the starting position before repeating the movement. How-To: first attach a lat bar (a bar featuring a singular neutral grip handle at each end meaning the palms face each other throughout the movement) to the seated row machine. Proceed to sit and grab each lat bar handle with the arms fully outstretched, then bend the elbows whilst bringing the bar into the body just below the sternum until both elbows reach a 90 degree angle. Extend the arms and return to the starting position before repeating the movement. How-To: Start with a cable pulley set roughly two notches above the middle setting, and attach a cable rope handle. Now grip the rope at each end with a double overhand grip and proceed to bend the elbows whilst pulling the middle of the rope towards the face until it rests roughly one inch short of making contact. From here, return to the starting position and repeat the exercise. Ensure your shoulder blades are tightly pinched together throughout the movement. Pro Tip: Do drop sets for increased results. Read all about it here. These workouts are going to deliver the back results you’re looking for regardless of your current training goal. Simply follow these back workout routines and remember to vary the rep and set counts being used at least every two weeks should you choose to perform the same routine a few weeks running. You’ll also need to completely change the exercise order to keep your body guessing. All exercises to be performed for between 6-8 reps unless stated otherwise for a total of 3 sets each with a 120 second rest period in between sets. Focus on performing a 3 second negative (on the way down), 1 second hold (at the bottom) and 3 second positive (on the way up) count for each movement. Ensure you fully stretch the back at the end of your session to avoid blood pooling. ​This routine is designed to help in the development of the general muscle tone in the back area and further develop the foundations created by exercises such as the deadlift and chin up. All exercises to be performed for between 10-12 reps unless stated otherwise for a total of four sets each with a 60 second rest period in between sets. This workout routine is going to send your level of back strength skyrocketing within a short time frame provided you perform all of the below exercises with perfect technique. All exercises to be performed for between 3-5 reps unless stated otherwise for a total of five sets each with a 240 second rest period in between sets. Focus on performing a 2 second negative (on the way down), 1 second hold (at the bottom) and 2 second positive (on the way up) count for each movement. All exercises to be performed for between 8-10 reps unless stated otherwise for a total of four sets each with a 90 second rest period in between sets. Ensure you fully stretch the legs at the end of your session to avoid blood pooling. ​This back workout routine is for improving the endurance of the back and assisting with its overall conditioning - this in turn will also impact muscle tone. All exercises to be performed for between 15-20 reps unless stated otherwise for a total of five sets each with a 30 second rest period in between sets. These back routines will provide the blueprint you need to follow in order to create the most amazing back possible. 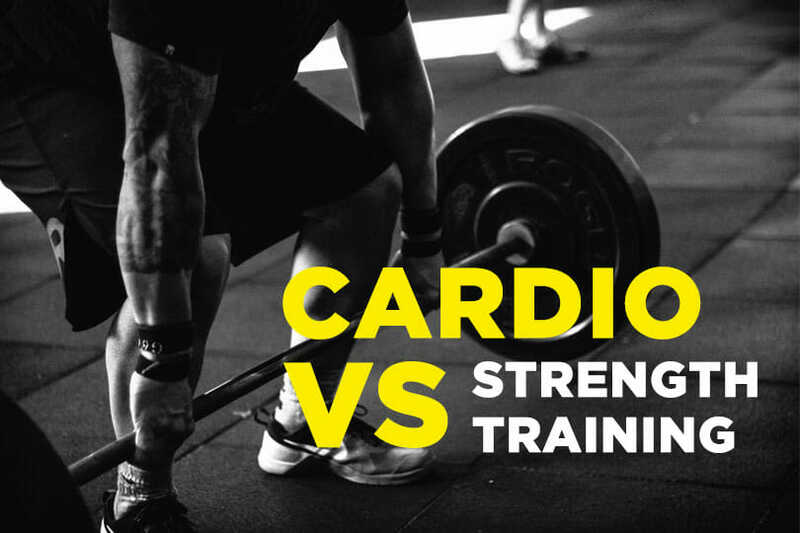 ​Follow these workouts, incorporate all of the exercises listed and above all else perform every single one of them in accordance with the tips listed at the beginning of this article. As a result, back day can become one of those “back burner” training days that neither excites nor inspires you to put your best into the session. So... here are the 3 main mistakes we commonly see with beginners. 1. 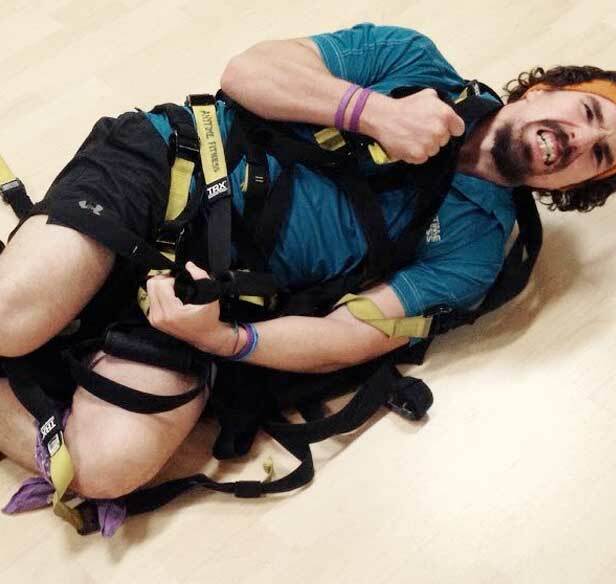 Shoulder Position: Pinch The Blades! 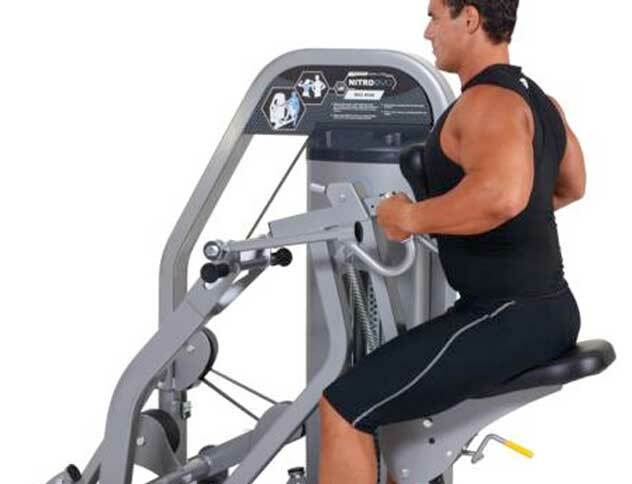 You need to say the phrase “pinch the blades” to yourself at all times whilst performing a back exercise. This simple but highly effective integration will make all the difference in the world in regards to effectively feeling your back muscles work. It’s also important that we state something perhaps obvious - if you’re not feeling the area, you certainly aren’t integrating it to its fullest extent, as you should be. Squeeze your shoulder blades together tightly when performing them - this will help to expose the lat muscles, thus indicating that you’re targeting them. When you perform a back movement without making this one small change, your shoulders actually completely take over and almost entirely negate your back integration. It’s these little details that make a world of difference. In conjunction with your shoulder blade position, you’re also going to have to keep a keen eye on your hips too. The muscles you target when training your back almost seamlessly flow into your glutes and hamstrings - this makes it all too easy to fire off your hips to get the weights up when things start to get a little difficult towards the last few reps of a set. If you’re serious about building the best back possible, you’re going to have to keep your hips locked in position and ensure your shoulder blades are tightly pinched back at all times. 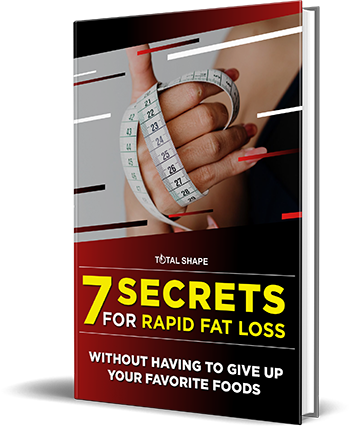 This is largely going to rely on dropping your weight volume down, and that’s a good thing - it means you’ll grow. This is one of those instances where you’re going to need to swallow your pride a little and go back to the drawing board if you want to make the kind of progress you should have by now. What If My Body Positioning Is Already Great, What Else Am I Missing? 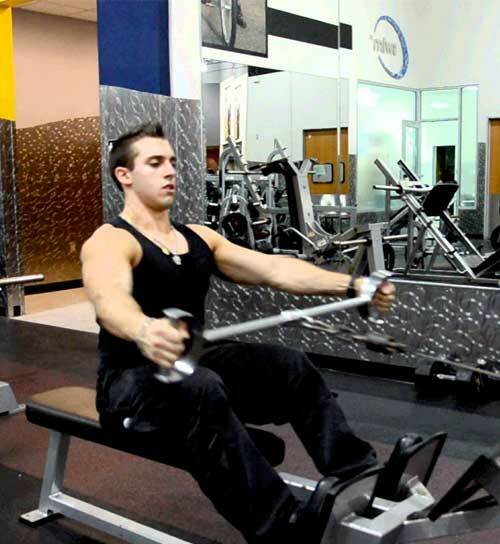 No two sessions should ever look the same on paper if muscular growth is your primary goal. ​If you’re performing the same session plan two weeks in a row, ensure that you change the order of exercises and rep count being used. Either that, or completely change the exercise choice. It doesn’t matter how you play with these variables, but one element that is going to be crucial is that you cover every area of the back successfully throughout your session. Provided all areas are covered and you’ve adhered to the above variables; you’ve nailed a successful back session. Whilst you won’t know absolutely everything there is to know about training the back just by reading this guide, you now have more than enough material to go out there and tackle your next back session on the right track. What are your favourite back training exercises? Do you have any tips you’d like to share with the community? If you feel that this article helped open your eyes in regards to some of the mistakes you were perhaps making with your own training, please share this information with as many people as possible on social media - you could play a huge part in their future back progression. Go out there and enjoy your next back session.